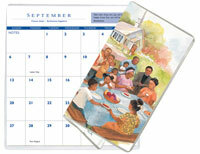 Two Year Planners for fundraising are widely popular amongst churches. Two Year Planners come in a variety of assortments including inspirational, devotional, american and general. Two Year Planners typically sell for $2.00 but several groups have sold them for more making even higher profits! If you are looking to purchase 2 Year Planner Fundraisers, please fill out the short form below or call (866) 674-7317 and we will find the fundraising dealer that will provide the best profit for you and your group.